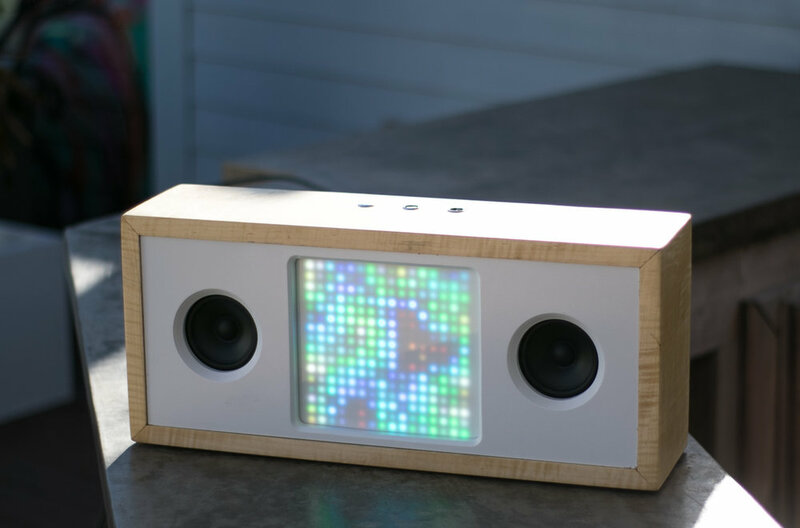 Modustrial Maker featured on the Modern Maker Podcast! My favorite makers talked about the Modustrial Maker YouTube channel on their weekly podcast. Chris Salomone said some very kind things. This is very exciting, as these guys are the ones who inspired me to start making. Check it out via the link below! I just created a step-by-step written tutorial for the concrete and copper coat rack on Instructables. Check it out if you are interested in making one, or in making anything with this type of geometric tile using GFRC. In this video, I show how to make this DIY geometric concrete & copper pipe coat rack (or hat rack, or skateboard rack, whatever you prefer). This build is really easy to do and fairly inexpensive. It uses a cheap 3D PVC tile as the base of the form, to give the coat rack its geometric shape. You can buy any sample of one PVC tile, to customize the geometric shape of the rack how you like. The project uses Fishstone GFRC concrete mix so that the tile can be cast at only ½” thick, and be light enough to hang on the wall. This is a “just add water” mix, which is incredibly easy to use. I embedded copper pipe pieces in the form and poured the concrete right around them, so that they would serve as posts for hooks. I then used more copper pipe to build hooks in interesting shapes, around the embedded posts, after the concrete cured. This was a fun experiment, and could lead to all kinds of things that could be made using this technique for PVC tile as a concrete form. A few edits to the commentary -- thanks to my subscribers for pointing these out! 1. Nail polish remover (not nail polish) cleans copper pipe. 2. I used a hot glue gun on the concrete form (not super glue). 3. The GFRC mix takes 1 gallon of water per 50 lb bag (not 1 lb). it takes your projects to a completely different level, and is totally doable with a bit of research and can-do-it-ness. 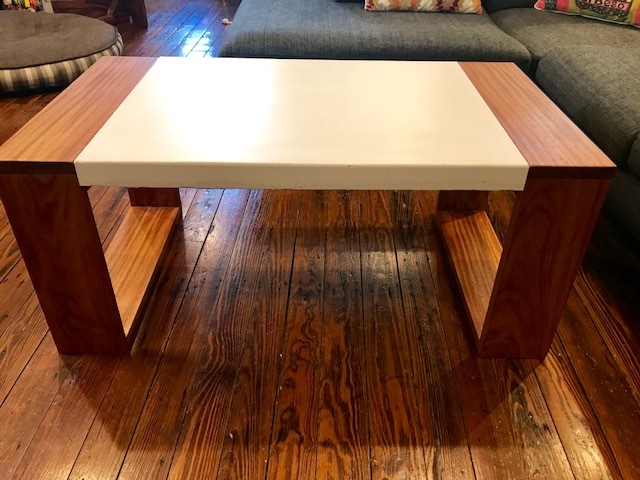 This is easily a $1000+ coffee table, which Stephen created for less than $600, including all the tools needed for the project. He saved money, and set himself up to create more gorgeous designer-level pieces at a huge savings. 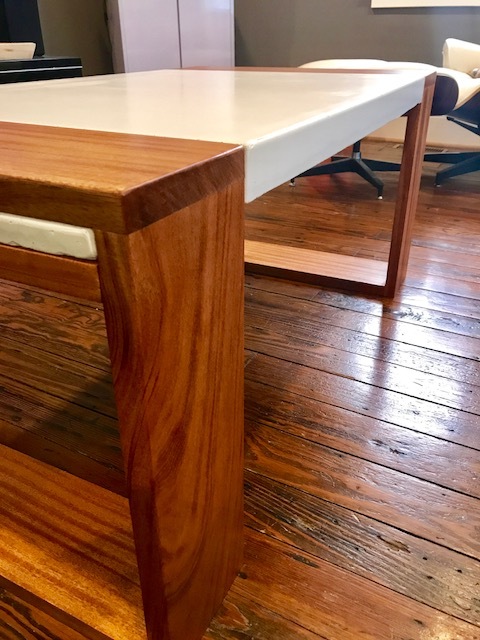 I used a form and made 'fake' legs with the scrap wood and put that in the melamine form. Then I poured the concrete. I replace the scrap wood with the real legs after the pour, and added the bottom piece of wood in at the end. Thank god for GFRC so my pocket hole screws held fine in the concrete. I even looked up the sheer strength of the screws so I will be fine with the 5! I put on each side of the bottom piece of wood. I used the U-sealer from Fishstone. There videos and yours made my life so easy. I probably spent about $600 when its all said and done BUT the next build would be much less expensive because I have the tools, knowhow and all i need now is more concrete. And lastly, more pics of the table and the build process. Video for DIY Modular Garden just uploaded! In this episode, I show how to make a DIY Modular Wall Garden with Plant-Grow LED Strip Lights, and White LED Lighting. The entire DIY wall garden is made out of a single sheet of plywood, and is my entry into Kreg Jig’s One Sheet Contest ( #kregonesheetcontest ). Each planter is modular, in that it attaches with magnets, and has magnets on two sides, allowing it to be flipped 90 degrees and re-attached as a cubby hole in the same location. This might seem a bit unusual as a project, but I think it is a cool way to get plants into areas that you otherwise couldn’t, and to provide some flexibility to change the setup to provide more or less storage. It would work great to add greenery. Storage, and lighting behind a desk, in an office, or in an entryway / foyer (where I will be using it). 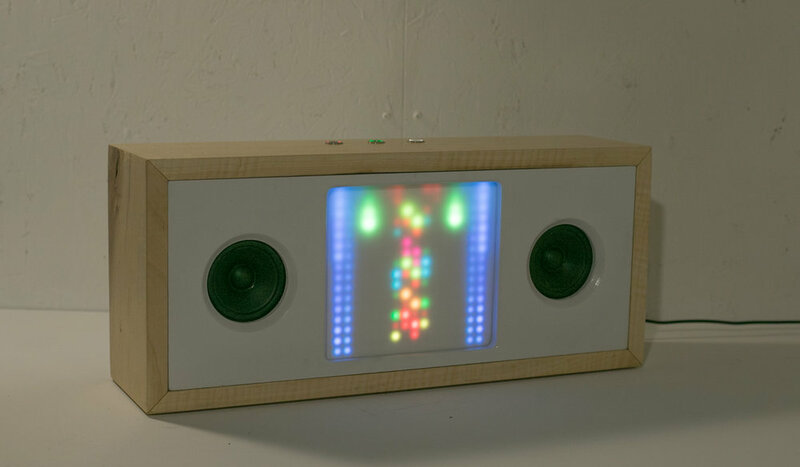 The white LEDs are SK6812 WWA LEDs, and are controlled with an inexpensive controller, which allows them to be switched between warm white / cool white / amber colors, and to do some fun chasing animations. I made this simple modern desk organizer, with a built-in stand for my Amazon Echo Dot, from scrap plywood and a scrap piece of leather. The plywood was a piece I had leftover from the #kregonesheetcontest. This is a really simple build I think anyone could do. You could make it with only a circular saw, a drill, and a jigsaw if you wanted to. I always have a couple projects in the pipeline for Modustrial Maker. Right now I'm working on a man-cave maker with my friend Al, which actually is a few projects in one: reclaimed wood wall, concrete countertops, cabinet install, and LED TV wall. Here is a quick video of the reclaimed Stikwood wall going up. I'm also working on a cantilevered live-edge maple table with an angled concrete post as the base. I haven't seen anyone else make anything quite like it, and am really excited about the design. The video will be up next week.